Body Science delivers the impossible—low carb protein bars that are low calorie and high protein, with 3 layers of award-winning taste! Are these the best tasting protein bars ever created? Quite possibly. These bars are nutritionally balanced with enough flavour to boot your palate into a parallel dimension. 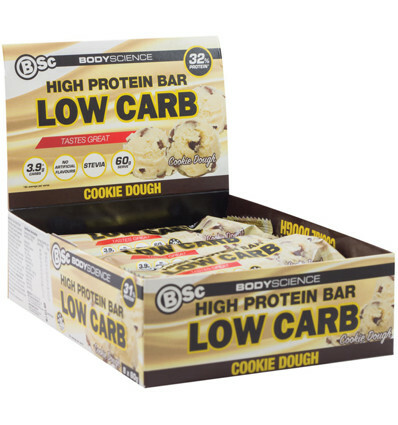 With four types of protein added to each bar, Body Science Protein Bars has got your amino acid needs covered, in both a fast-release and sustained-release kind of way. With two types of whey protein, casein and soy protein isolate, each bar ensures that you get the right amount essential amino acids to support an important process called muscle protein synthesis. 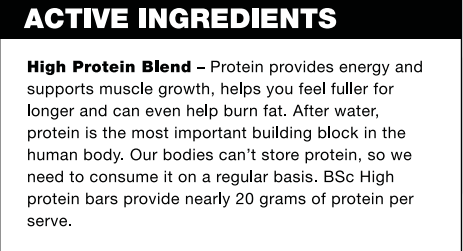 If you're not a bodybuilder, don't worry, these bars won't make you all bulked up ... muscle protein synthesis simply supports your body adapt to your chosen form of exercise. Muscle protein synthesis (MPS) is a process in the human body that is good for everyone. It keeps our muscle healthy, renewed and strong. If we are training to increase lean muscle mass, this process will speed up the process. If we just want to maintain muscle mass and get fit, which is reflected int he type of training that we do, then MPS facilitates this also. And for MPS to take full effect, we need the building blocks of the human body—essential amino acids! Whey protein, casein and soy protein are rich sources of all nine essential amino acids. The humble legume is completely underated. It actually contains a great deal of protein nutriton. Soy protein isolate has actually been demonstrated byThe Journal of Applied Physiology back in 2009 to be comparable to hydrolised whey protein at stimulating MPS1. 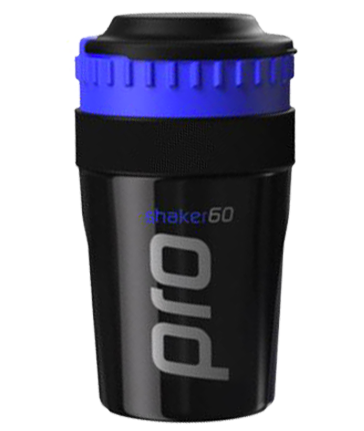 In addition, whey protein concentrate/ whey protein isolate is well known as perhaps the best stimulators of MPS2. 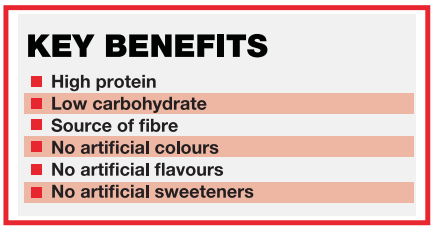 Body Science have delivered a no artificial colours, flavours, sweeteners and no added sugar protein bar designed to ensure you never have to experience another dry cardboard-like bar again! For a healthy nutritious snack or to increase protein intake you can't go past BSc Protein Bars. Best Protein Bar for Weight Loss? These low carb bars bring some of the gourmet deluxe flavour into a fat-loss program that can often be sorely missed. They may be used as a snack throughout the day, or as an occassional dessert warmed up. If you decide to warm them up, do yourself a favour and eat them with the smallest spoon you can find. That way, every bite is enjoyed to the maximum. Are Protein Bars Good Before a Workout? As a general rule, it's good to exercise on an empty stomach. This means no food or thick drinks for 2-3 hours before exercise begins. When you're exercising, digestion is not high on your body's priority list. In fact, digestion becomes "shut-down" to a degree when exercising heavily. However, if your goal is to gain weight, or you are engaging in low to moderate intensity endurance exercise, you may like to try a bar 1/2 hour before exercise. INGREDIENTS: BSc Protein Blend (Dairy Protein Blend [Whey Protein Concentrate, Whey Protein Isolate, Calcium Caseinate], Soy Protein Isolate}, No Added Sugar Protein Chocolate (Maltitol, Cocoa Solids [33%], Milk Solids [20%], Soy Protein Isolate, Emulsifiers, [Soy Lecithin], Polyglycerol Polyricinoleate], Natural Vanilla Flavour, Polydextrose, Malltitol, Humectant (Glycerol), Sorbitol, Vanilla Paste, Glycine, Sugar Free Mint Chips (2.5%), Canola Oil, Soy Protein Nuggets, Cocoa Powder (1.5%), Stevia Extract, Natural Flavour, Emulsifier (Soy Lecithin), Salt, Antioxidant (Mixed Tocopherols). Made on equipment which processes peanuts, tree nuts and sesame, therefore these allergens may be present.